Free Internet is now available in Nakuru. Launched on Friday 14th March 2015, the BilaWaya free Wi-Fi project by the County Government of Nakuru, Liquid Telecom and PSCU-Digital has made Nakuru become the third town in Africa and 16th globally to have free Wi-Fi in public places. As Winfred highlighted in the article Liquid Telecom connects Nakuru County to free and fast high capacity Wifi, Liquid Telecom is set to provide up to 1 Gbps free Internet in Nakuru that will cover a 10 kilometre radius starting from Nakuru’s CBD, allowing almost all Nakuru residents to access free Internet right from their homes. In the first phase however, only 200 Mbps has been rolled out to cover Kenyatta Avenue, Marikiti Market, the main bus terminus at the CBD, Afraha Stadium, the county headquarters and the Westside Mall. BilaWaya is the name given for the free Wi-Fi in Nakuru. From the user end, the connectivity at all points of test is very strong with the promise to deliver up to 5 Mbps at full link speed. As you will realize from the results I obtained, the link speed is not the limit. BilaWaya, once connected, takes you to www.nakuruwifi.com from where you can sign in. More on this at the last section of this article. The speed of the Internet is currently great, smooth and exciting. Although the speed varies from point to point, those at the main bus terminus are able to access data up to 10 Mbps download and 4 Mbps upload speeds. At Kenyatta Avenue, the speeds reduce to slightly below 1 Mpbs download and 0.2 Mbps upload. The variations in speed does not however impact on the experience of light users whose intent is to browse web, chat on Facebook and WhatsApp and play some online light games. The heavy users – those interested in downloading and uploading heavy files, watching videos on YouTube or elsewhere, etc, must mind the differences in speed availability at various spots to avoid frustrations. The image below shows the different speeds I obtained in the two places at different times. From top to bottom, the first three results were obtained at different points at the Nakuru main stage – which is basically the area between Sokoni Plaza where Crossland and 2NK shuttle Nakuru-Nairobi matatus have their respective stations to past Top Market all the way to Mololine Bus Stage. This is the area that was able to give up to 11 Mbps download speed that finally averaged at 9.48 Mbps. Again from top to bottowm, the 3.99 Mbps download was obtained at Sokoni Plaza, 8.20 Mbps obtained near Top Market and the 9.48 Mbps was obtained at the Mololine Bus Stage. The last three results (from top to bottom), which were the first to be done according to the timeline, were results obtained at Gilanis supermarket area, Mololine Prestige Bus Stage and Tuskys Supermarket Kenyatta Avenue respectively. As can be seen, the farther away one moves from the main bus stage, the slower the speeds become. Interesting though is that the connectivity remained at “Very Strong” with Link Speed of 5 Mbps as indicated in the first image. Internet stability is basically a measure of continuous availability of the connection at millisecond, second, minutes and even hours levels. Internet stability is determined by latency, a measure of time delay from one networked point to another. For example one connection like fibre can allow for data to travel back and forth between your gadget and Google servers in 11 milliseconds – but if satellite connection was used, this time can scale up to 700 milliseconds. Most of the time Public free Internet have less stability due to congestion issues. When everyone pings the server to connect them to different websites across the globe, the server becomes overworked and will not respond in a timely manner hence becomes unstable (increased latency). 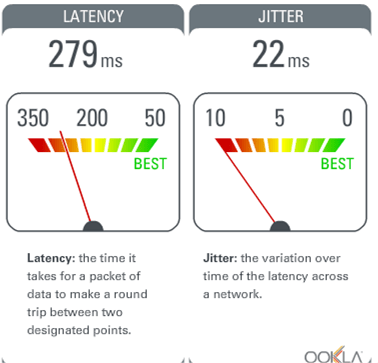 Jitter is merely the variance in measuring successive ping tests. Zero jitter means the results were exactly the same every time, and anything above zero is the amount by which they varied. Like the other quality measurements, a lower jitter value is better. And while some jitter should be expected over the Internet, having it be a small fraction of the ping result is ideal. So far BilaWaya has no worrying stability issues as was determined by the two stability tests I did: the ping test via http://www.megapath.com/speedtestplus/ and also by playing my favourite one minute lightning chess game. From the lightning chess games I played, I deduced that the BilaWaya Internet connection is stable up to 2 to 5 minutes. That is, you can remain connected to the Internet with zero interruption over that period. The interruptions, when they occur, also take only 2 to 10 seconds to reconnect. If you were to download a file at 5 Mbps speed, then for two minutes you can download a 75 MBs of data without interruptions. If you are lucky to have the five minutes non-interrupted connection, then you’ll be able to to download a 185 MBs file without having to curse anyone. Even when connection is interrupted, the 2 to 10 seconds needed to reconnect and the fact that most browsers and mobile phone download managers allow for over one minute “attempting download” grace period before interrupting downloads means your 1 GB of data will be downloaded in under 15 minutes. Reliability is the availability of the Internet every time it is needed. How often is BilaWaya off? The tests were done yesterday, Sunday the 15th March 2015 between 4:40 and 6:30 pm so Basically there are no test results on reliability. The population of Nakuru County is given as 1.6 million from the 2009 census. The same census provided that residents of Nakuru town were slightly over 300,000. With a 2.7% national population growth rate, and assuming that Nakuru town, being a cosmopolitan town with a two and half hours proximity to Nairobi, has the same growth rate, then we can say that today Nakuru has a total population close to 350,000, 40% of which should be people able to access Internet by age. Considering those who might own smartphones in Nakuru, it can be estimated that over 70,000 people should be able to access the BilaWaya free WiFi in Nakuru at any given time. Whether this demand will be satisfied with the 1 Gbps capacity set up by Liquid Telecom is something we wait to see. According to calculations I have performed using the Bandwidth demand estimator, every 1000 people would require 81 Mbps connection speed and if this is taken linearly, then the 70K people should require roughly 5 Gbps bandwidth for smooth Internet access. As of today the demand on BilaWaya is close to zero. During the test, I was able to ask 15 random people (that I prejudiced to be 5 farmers, 5 students and 5 businessmen and women) whether they 1. Are aware of BilaWaya and 2. Use BilaWaya. Only 6 people (2 students, 4 business men and women) said they were aware of the free BilaWaya Wi-Fi and only the students affirmed that they were already using the free Internet. The unscientific research thus tell us that only 13% of those in Nakuru CBD use the BilaWaya and that most of them are students. If you read this article by the Standard that was written at the first launch of the free Wi-Fi Internet in Nakuru back in March 2014, and watched this video by NTV, one question is prominent, is the free Wi-Fi sustainable? My answer is a big yes. 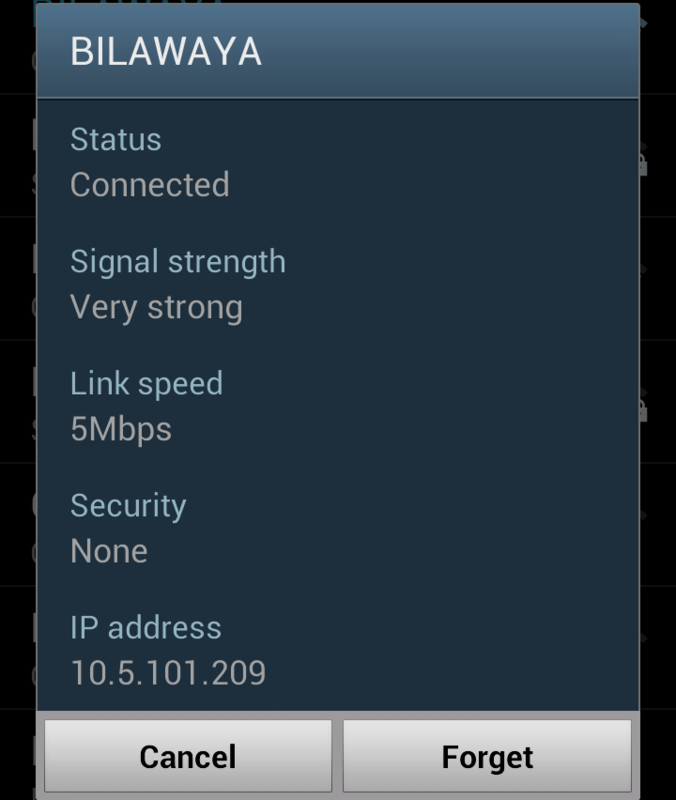 BilaWaya has a supporting website which is www.nakuruwifi.com (I don’t know why it is not a .co.ke). Once one selects BilaWaya Wi-Fi from the list of available Wi-Fis, you are taken to the website from where you are required to sign in. Signing in basically means being taken to website’s home page. What this means is that everyone who uses BilaWaya must access www.nakuruwifi.com website (see featured image at the top of this article). I do believe that Liquid Telecom, Nakuru County Government and Dennis Itumbi’s team under PSCU-Digital have considered to allow the farmers, colleges, and businessmen and women to place ads at the homepage of this website. If for example only 20,000 people will access this site per day thanks to the free Internet service, then whoever places an ad at nakuruwifi.com homepage for eggs or shoes will be assured that not less than 10,000 prospective customers shall have seen the ad. If a medium sized ad can be charged at the rate of Shs 5,000 per day, and spaces (header, left, right, and footer sidebars) allow for 20 ads, then each day the website can generate Shs 100,000 which comes to Shs 3,000,000 per month. As the website become popular and more people engage with the homepage, then the ad rates can be raised to ensure that the project runs at a profit. Other revenue generation streams would include sponsored articles featuring colleges, farmers, and the business men and women targeted at the rate of Shs 50,000 or so per article. To force people to see these ads, the BilaWaya Wi-Fi should be customized further such that in order to access the free Wi-Fi, one has to sign in from the bottom of the home page rather than sign in first before being taken to the homepage. This customization would mean that a user first scrolls down the page, sees the ads, before signing into the Internet to access other web sites and apps. If this model of providing free Internet in exchange for ads succeeds, then my dream that everyone across the globe can access Internet for free shall have been proven valid.